I am fully convinced that a baby's first Christmas is 98% for the sole enjoyment of the mothers. Because let's be honest. . . these little people are as happy rummaging through the bottle cupboard in the kitchen as they are with a pile of 2013's most popular baby toys. That being said, there is something so exciting about picking out a few special surprises for Christmas morning. A tiny labor of love for these precious babies in our home. It's also a wonderful chance to support the handmade community and add to our family collection of heirloom toys. So here I am, counting down the days til Christmas, like I am a kid again myself! 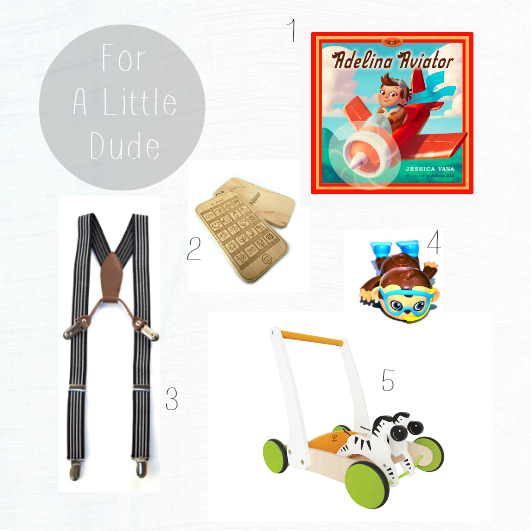 I cannot wait to watch Emmett cruise around with his little galloping zebras walker, as pushing things around the kitchen is his new favorite activity. And that little wood iPhone?! May he love it even more than mine. Haha!! What are you excited to watch your little people open this Christmas?! 36 hours and counting. . .
love these gifts! The suspenders are the best! those suspenders & that wood iphone are so cute! !